BicycleFriends.com: Success, I Ride the Tall Bike on Rollers! I blame Richard for this one... I rode the tall bike on my rollers! I am not sure how or why, but Richard came over and we got to talking bikes. 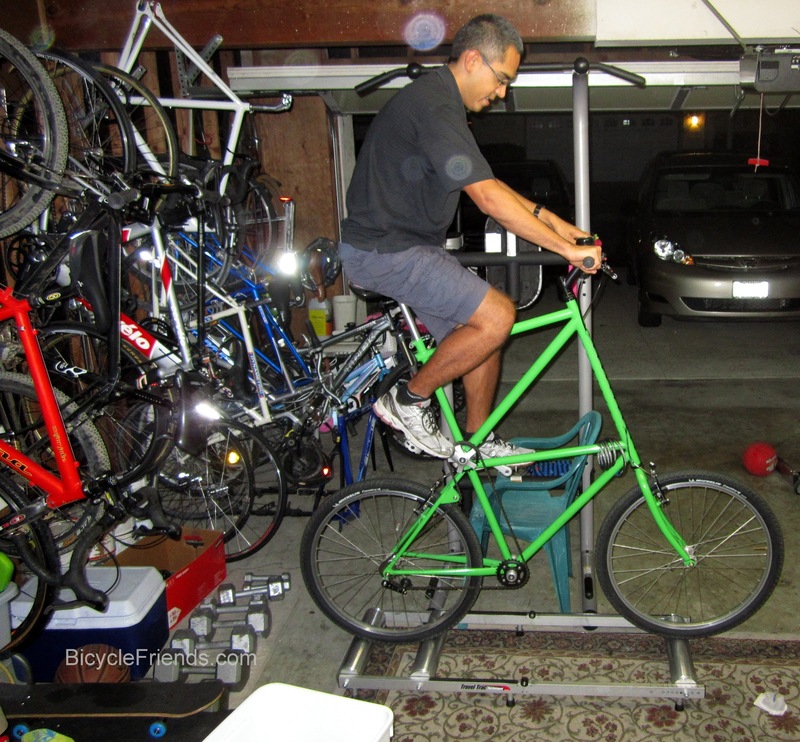 I was setting up my rollers for my evening workout and the topic of CicLAvia and my tall bike came up. THEN the topic of how do I balance on the rollers. AND THEN one topic lead to another and somehow I decided to try riding the tall bike on the rollers. I wasn't sure how to mount the tall bike once it was on the rollers but with some quick ingenuity, a cheap plastic chair, and pull up bars and I was ready to go! I have to admit, I was scared! It's really high up there and twitchy. I think with more practice and more confidence, I could ride the rollers longer. I was too nervous which made it difficult to focus, but I did manage to ride the rollers for a few seconds! Richard was the cameraman and Jamie was back up in case I fell.